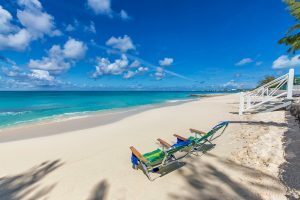 Ok, so you are looking at places to stay on Grand Turk or in the Caribbean. The task is daunting I know. Choosing a vacation rental just about anyplace these days is an overwhelming task. It used to be that there were only a handful of rentals to choose from and it was easy to narrow it down to one. And it’s no wonder vacation rentals have become so popular, it’s cheaper than staying at a hotel, if you are a family you save on booking multiple rooms and you aren’t packed in like sardines, you can save on eating out and you have the whole space to you and your family. occasional sea urchin (though I haven’t seen one) but for the most part they are at other beaches around the island and not ours. We are on the leeward side of the island, which means the water is calmer. The breeze can be a bit much at times when it is off the water of the windward side of the island. Our breeze comes across the land – perfect! 2. 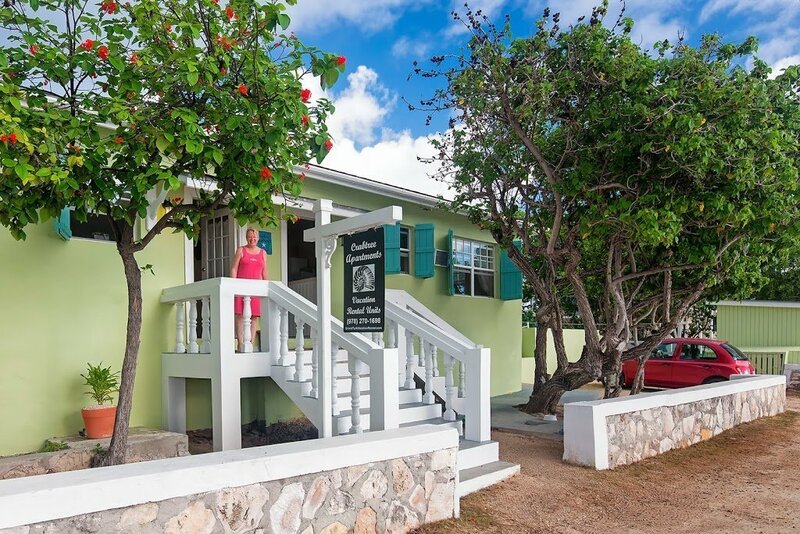 We are located within a 10 minute easy walk to 4 of the most popular restaurants on the island. The Bird Cage (Osprey Hotel), Secret Garden (Salt Raker Inn) The Sand Bar and the newest addition; The Turks Head Inne Restaurant and Bar, all located on Duke St. Taking a stroll down historical Duke Street is a must, you will feel transported in time. Most of the other restaurants are spread out over the island; there are a couple at or near the cruise ship terminal (these are closed except when the ship is in) and if the vacation rental you are looking at is located near the cruise ship terminal it means a taxi ride to any of the other popular restaurants. Being close to the Bohio (a great restaurant) means you would be about 1/2 hour to 40 minute (or better) walk to the 4 popular restaurants mention above. It’s worth asking how far of a walk you would be to any of the above mentioned restaurants. 3. Each unit has a large and comfortably furnished veranda that overlooks the sea. 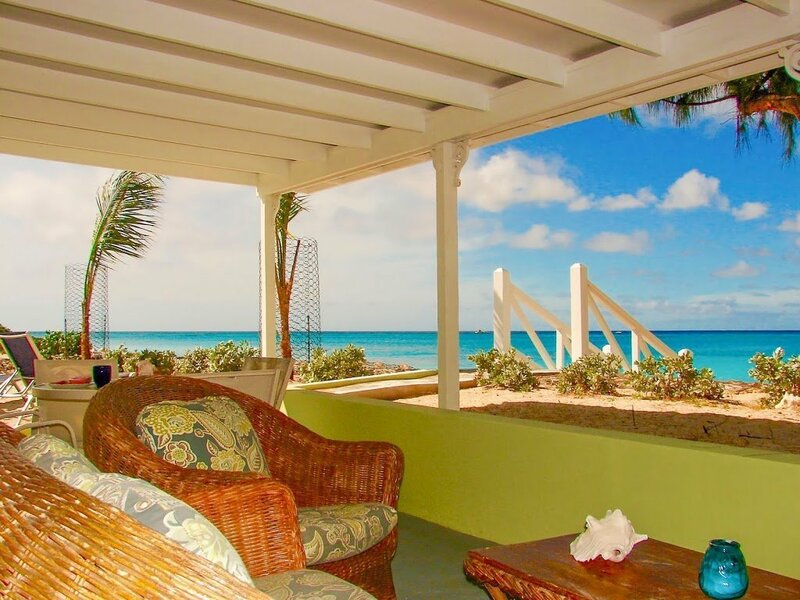 It’s the place you will spend most of your time, dining and lounging – the view is amazing!!! Wicker furniture to sit and read and a dining table to enjoy your meals or sip cocktails and watch the sun set. 4. We have been in business for over 12 years. We are serious about our business. We have an excellent reputation, wonderful reviews online and stacks of guest books with messages from our guests to prove it. One of these days I am going to transcribe these wonderful notes from our guest to share online. You can read the more current notes in the guest books that are located in each unit. 5. We have a great team. Our staff really cares about our guests. Jessalyn, my daughter does the booking for us. She will answer any questions you may have and if she isn’t available to answer it for you, she will get back to you very quickly. It makes a difference when you are speaking directly to the owners not a service. Jessalyn knows the apartments, the beach, the area and the island personally. If there is a question she can’t answer she will call me or Arelys and get the answer. Arelys is a friend of ours and looks after Crabtree Apartments for us. She would be the one to call if you had any questions or needs while on Grand Turk. Irsa is our maid. She has been with us for 7-8 years. She cleans everything squeaky clean and lets us know if anything needs repair or replacing. She even cares about the decor, asking for matching rugs or pillows to make everything come together. She wants it all to be perfect for the guest coming in. We have hired a garden business to rake and clean up the property every few days, they water the plants and look after the bicycles too. 6. Only 3 units on the property, all ours – We own the entire building that consists of 3 units side-by-side. We have done our best to make each unit feel private. Each unit has it’s own set of stairs to the beach, it’s own area to sunbath or sit in the shade, it’s own private veranda and it’s own front and back entrances. 7. Residential neighborhood. We are located on quiet residential street there is a Salina on one side of the street and private homes along the ocean side. There is not a restaurant, cruise ship, beach cabana or bar etc next door or in the immediate proximity. Just peace and quiet, though the action is only a easy walk or bike ride away when you want it. There is a grocery store close by (walking distance) that is open 7 days a week. 8. Great sunsets! 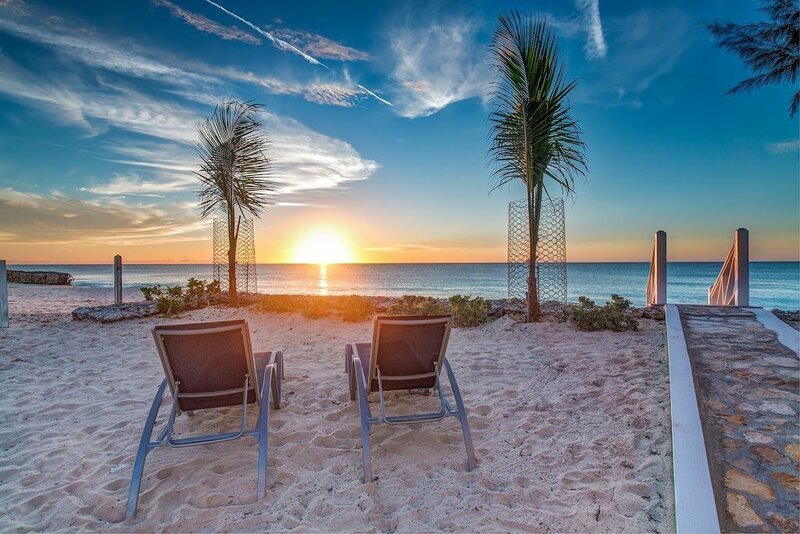 We are located on the west shore so you can catch a beautiful sunset almost every night. You might even catch a glimpse of the “Green Flash”. 9. We can accommodate larger groups. We have 3 – 2 bedroom units so we can accommodate groups up to 12 people. 2 of the 3 units have connecting doors between the units so a family or party of 8 can book both units and have the ability to feel like they are all together. We often have groups come and stay with us. They have so much fun they come year after year. 10. You won’t want to leave! Over and over again our guest say; “I wish we booked for longer”. Most of our guests aren’t ready to leave when it’s time to go and who would when you have the most amazing view to look at all day, a comfortable place to relax and unwind, a constant gentle tropical breeze, the lapping of the waves to lull you to sleep at night, sun every day, the sand beneath your feet and the warm sea to swim everyday. I think you will love Crabtree Apartments, we have comfortable units with 2 air-conditioned bedrooms with a full bath between the bedrooms, a fully equipped kitchen, dining/living room with access to the large veranda from both the living room and the oceanside bedroom. The second bedroom has a view of the salinas and the wild life they attract. There are wonderful views from nearly every room in the apartments.